In the early hours of June 4th, a trio of terrorists intentionally rammed pedestrians in a van on London Bridge before going on a stabbing spree in Borough Market killing, seven and injuring 48. The Telegraph published several reports on the brutal act of Islamist terror, including a summary of the attack (“London Bridge attack – everything you need to know” by Harriet Alexander) which included information on the perpetrators and victims, and relevant context. Telegraph editors included a graphic highlighting other ramming attacks across the world. As we noted in a tweet that morning, though attacks beyond Europe (in the US and Canada) were included in the graphic, the list omitted ramming attacks in Israel. 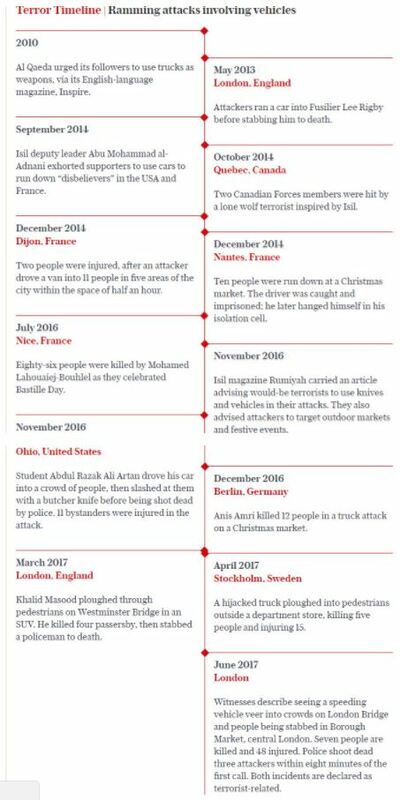 Original Telegraph graphic “Terror Timeline: Ramming attacks involving vehicles”. This omission was especially glaring given that a staggering 60 vehicular ramming attacks by Palestinian or Arab terrorists have taken place in the last few years alone. 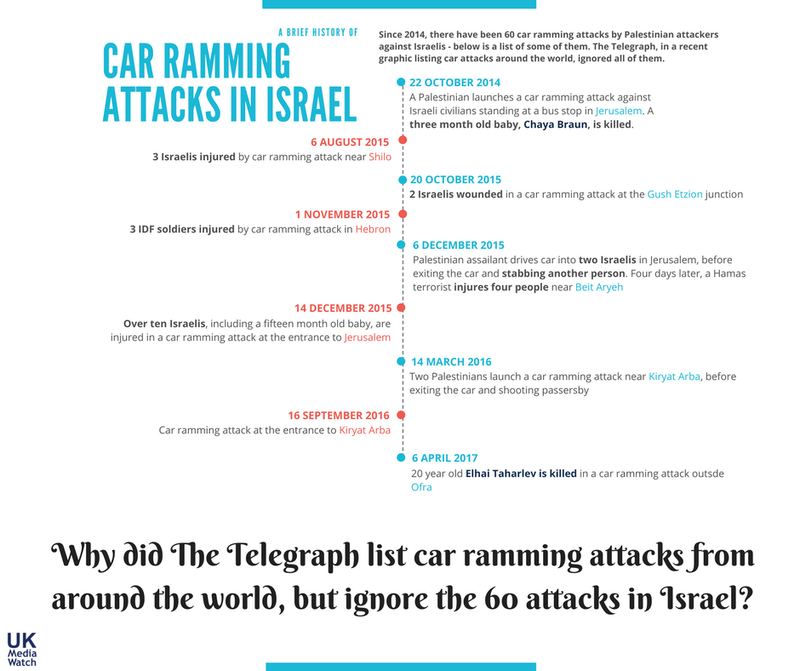 Ignored by The Telegraph: Examples of Palestinian car-ramming attacks since 2014. Use of the word “Terror”: We’ve documented examples of media outlets failing to use the word terror in characterising attacks in Israel (without ‘scare quotes’), whilst freely using the term (without such quotes) when attacks occur elsewhere. Misleading headlines: CAMERA ran a series on headlines during the recent intifada which “obscured Palestinian terror attacks and even recast terrorists as victims of arbitrary Israeli violence”, in contrast to far clearer headlines – both morally and textually – when reporting on other terror attacks. Prioritizing the suffering of a terrorist’s family over Israeli victims: We’ve revealed many instances of news outlets highlighting the suffering of jailed terrorists and their families, whilst consistently ignoring the pain Israeli terror victims and their families – a perverse dynamic in journalistic sympathy you rarely if ever find in reports focused on attacks elsewhere. Greater emphasis on the Israeli response to terror, rather than the attack itself: Media outlets often amplify or legitimise the Palestinian narrative suggesting that Israeli security personnel who respond to terror are carrying out “summary executions” or some other “disproportionate” response. Such narratives are almost entirely absent in reports on terror attacks in places like Paris or London. Rationalising or even excusing Palestinian terror: Reports on terror attacks in Israel sometimes suggest that government policy (concerning the Al Aqsa Mosque, or the ‘occupation’) motivated the attack, rather than the extremist, violent and antisemitic ideology of the terrorist. Though some reports on British or French terror do mention the grievances of the perpetrator, it’s not treated with anything approaching the seriousness given to alleged Palestinian grievances. To be fair, the Telegraph is far from the worst UK news outlet when it comes to such media double standards. However, their omission of Palestinian car rammings within the context of the London Bridge attack is illustrative of a wider media phenomenon by which Israelis are often placed in a different category of victims – men, women and children whose suffering often seems to occupy a space beyond the sympathetic imagination of many journalists and editors. Note that the ramming attacks first started with the Palestinians and were then copied by others. The Palestinians have been at the forefront of ever terror “style” we have seen, from hijacking planes, via suicide bombers, to car rammings. And the Europeans continue to love them for it. Jews get killed – what’s not to love? The car and truck ramming in Israel are ignored by the press while giving so much coverage by the press in Britain and France. Do Israelis suffer less than other nations. Israel has had 60 car rammings in the last 3 years.